Soft-spoken and unassuming, Ken Millard thought nothing of leaving his small Galiano Island cabin, heading to the big city and taking on the captains of industry. He considered it a small task, given that the stakes were so high: preservation of a rare forest ecosystem that was under siege. If that meant wrangling a 20-minute meeting with billionaire Vancouver businessman Jimmy Pattison and stretching it out to an hour and a half, so be it. While he did not win over Mr. Pattison completely, Mr. Millard did buy enough time to stop development in its tracks. For Mr. Millard, along with a small group of equally committed green activists, that struggle to preserve the island’s Douglas fir environment from logging was the beginning of a long mission to save and restore as much of Galiano’s natural habitat as possible. His success was remarkable. By the time Mr. Millard died of a heart attack on Sept. 27 at the age of 74, he was a towering figure and mentor in the province’s land-trust movement, revered for spearheading the transformation of a narrow, idyllic island of 1,200 mostly laid-back residents into a conservation juggernaut. After thwarting the plans of forest titan MacMillan Bloedel Ltd., the Galiano Conservancy Association, which Mr. Millard co-founded in 1989 and essentially led, has gone on to purchase nearly 200 hectares of valuable tracts of land on its own. These richly diverse areas, including scarce wetlands, woodland trails, precarious forests of Garry oak and Douglas fir and majestic beach fronts, are now permanent nature reserves. Among them is a large, formerly scarred and defoliated chunk of industrial land that the conservancy has spent 15 years restoring to its original state. Restoration has been so meticulous that it serves as a living lab for a University of Victoria environmental studies course on ecological regrowth. The property’s acquisition was typical of the way Mr. Millard operated. The 68 hectares had been owned by Telus Corp. to allow a communications cable to slice across Galiano on its way to Vancouver Island. Mr. Millard saw possibilities. He boldly approached the company and suggested that it didn’t need all that land, just the cable. Telus thought Mr. Millard had a good point; the company sold the property cheaply to the conservancy and kept the the cable’s right of way. The pinnacle of the conservancy’s many successes is its ambitious Learning Centre, on 75 hectares of acquired forest, wetland and waterfront. Over the years, the centre has hosted more than 30,000 visitors and focuses on teaching disadvantaged young people, seniors and immigrants about the joys and wonders of the natural outdoors. Mr. Millard was the driving force behind it all. “From the very start, it was his vision that inspired us. Always,” Ms. Smith said. 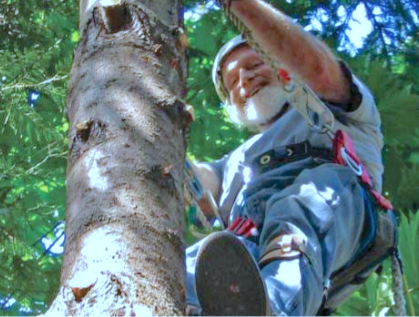 With his prominent white beard, Mr. Millard seemed to dominate public participation on the island, always showing up to fix something, cajole residents to get involved and most of all, indulge his great love for Galiano’s trailblazing forest restoration project. A photo taken a few weeks before he died showed him up a tree in the middle of the forest. His smile could not have been wider. For all his achievements as an environmental campaigner, that was only one facet of Mr. Millard’s remarkable career. He started out as a university physicist, earning a doctorate in the complex field of statistical mechanics. Then, in his late 30s, he made an astonishing career switch – to hand-crafting bows for violins. They were not the modern bows used by most violinists. Rather, Mr. Millard specialized in baroque violin bows, which were only then beginning to be made again after an absence of 200 years, to meet a growing interest in playing early music on period instruments. Within a year, operating mostly on instinct and what he called “a feel” for the wood he was shaping, Mr. Millard had emerged as a pioneer luthier in a field where there were almost no original baroque bows left to study. Sadly, Mr. Millard was eventually forced to abandon his bow-making because of serious health problems resulting from sensitivity to oils in the tropical wood he used. The second of three children, Kenneth Young Millard was born July 10, 1941, in Takoma Park, Md., not far from Washington, D.C. When he was 10, his father died, and his mother had to raise the family on a secretary’s salary. He attended Bethesda-Chevy Chase High School, where he met Linda Lowden, three days his senior. They became high school sweethearts, marrying at 20 and forging an exceptionally strong partnership that lasted 54 years. Mr. Millard earned his doctorate at Case Western Reserve University in Cleveland, where the couple’s daughters, Beth and Lisa, were born. He liked to joke that he chose physics because everything could be reduced to just a few equations, making it easier for his poor memory. Following a dispiriting year at a rural college in Missouri, the family moved to British Columbia in 1972, when he accepted a visiting professorship at Simon Fraser University. He left academia three years later, shortly after refusing to cross a picket line set up by striking teacher assistants, among them his wife. The Millards were enchanted by Galiano, from their first visit in the late 1970s. They soon bought property overlooking the ocean and settled there permanently in 1988, just as Mac-Blo was gearing up to clear cut a large swath of its forest holdings. The end of his bow-making left Mr. Millard free to embrace the Galiano Conservancy as a full-time cause. When Mr. Pattison, a member of the board at MacMillan Bloedel, challenged the group to raise $1-million to show they were serious about offering to buy the company’s forest lands, Mr. Millard led an astonishing fundraising drive in the small community, which somehow came up with the money. But Mac-Blo brushed them off, deciding instead to divide and market its land into large residential lots. A lengthy, bitter fight ensued that included an unsuccessful suit by the company against the conservancy to stop its activities, one of the first examples in Canada of a strategic lawsuit against public participation. The dispute also engendered numerous other legal battles and hard feelings by those who had purchased the lots. The matter was eventually settled by the governing Islands Trust, which made it very difficult for owners to build on their lots without preserving most of their land as forest. Mr. Millard’s legacy endures. He leaves his wife, Linda Millard; daughters Beth Thiessen and Lisa Millard; brother John Millard and sister Doris Spencer; and five grandchildren. ← What Does Drizzle Lake ER and Superpredator Humans Have in Common?